Polar form of complex numbers is another way of representing complex number. z= a+ib is the rectangular form of a complex number. z = r(cos θ + i sin θ) is the polar form of the complex number. Here 'r' represents the absolute value and 'θ' represents argument of the complex number. In the above diagram x- axis is the real axis and y-axis is the imaginary axis. We will express real and imaginary part of the complex number in the form of r and θ where r is the modulus and θ is the argument of the complex number. θ is the angle made by the complex number with the real ( x) axis. cos θ = a/r and sin θ = b/r. r cosθ = a and r sinθ = b. Note: If a > 0 then θ= tan ⁻¹ (b/a). Express z= 1+i in the form of polar. Let us find the value of r.
and cos θ = a/r and sin θ = b/r. So the polar form is z = 1/√2(cos π/4 + i sin π/4). Convert in to rectangular form. 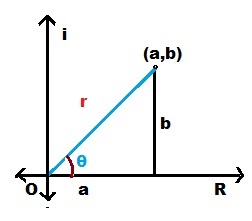 a = r cosθ and b = r sin θ. Students can through the examples and explanation on their own. If you are having any doubt you can contact us through mail, we will help you to clear your doubts. We welcome your valuable suggestions for the improvement of our site. Please use the box given below to express your comments.